This Christmas I must have been a very good girl as I received lots of wonderful gifts. Here’s my favourite food, beauty, fashion and other gifts and where you can get the same. It’s not Christmas unless you get some smellies for the bath. I’ve received loads of not so pleasant bath stuff over the years, but if you let people know what shops you love (ie Lush) you can get some wonderful bits you’ll actually use. Above I got the beautifully scented Rose Jam Bubble Bar in the black package from Lush. It has a lemon, rose and geranium oil scent and leaves your skin soft as a babies after melting it in your bath. I also got the biggest bottle of Snow Fairy Shower Gel from Lush which is my absolute favourite! This is a huge 1kg bottle which is only in shops around Christmas time, so be quick if you want to get some! With a subtle shimmer and a candy floss scent, this is one I ask for every year without fail! Next to the shower gel is my final product from Lush, the wonderful Fairy Dust. This has the same sweet scent as the Snow Fairy Shower Gel and is a shimmer powder for the skin. Fairy Dust feels like talcum powder when applied and leaves a wonderful sparkle, as well as that gorgeous scent. And finally the pretty bow bath bomb at the end. This is the only product not from Lush but from an independent shop. It has a lovely gentle scent like talcum powder and is sparkly and feminine. Handcrafted bath shops are great for gifts that are not mass produced, so don’t overlook them when choosing gifts. When it comes to bath goodies, quirky and unusual is often appreciated. Whilst I love nice shower gels and bath bombs, unique scents and fun gifts are something I welcome. 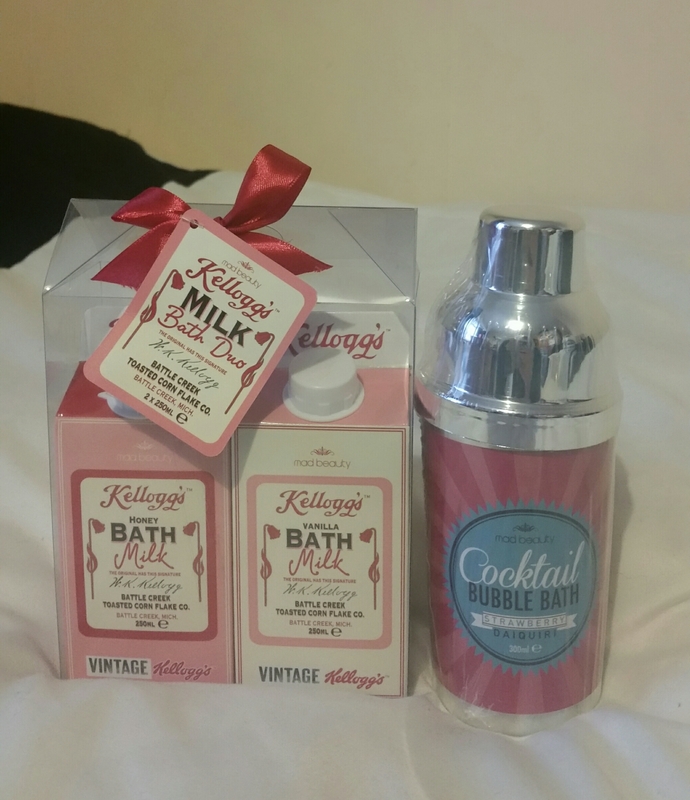 The bubble bath and bath milks above are both from Tesco, showing you don’t need to spend a fortune for good gifts. The Kellog’s Bath Milks on the left are in quirky milk bottles and have lovely honey and vanilla scents. As well as being a fun gift, bath milks are moisturising and soothing on the skin so a good alternative to bubble bath. This Strawberry Daiquiri Bubble Bath not only smells great but comes in a brilliant cocktail shaker bottle. A nice gift for yourself or that cocktail lover in your life, this is a gift sure to please. Oooh I like the quirky bath stuff!